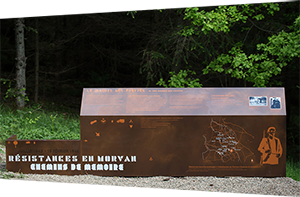 In July 1943, the resistance fighter Joseph Pelletier took charge of four boys trying to avoid STO (Compulsory Work Service) and hid them in these woods. After relocating a few times in the surrounding woods, the maquis came across this set up on 14 February 1944. The following day, a team of collaborators managed to find the camp and killed five maquisards: Lucien Cortet, Jean Dechaume, René Goussot, René Viatre and Gabriel Lavault. Charles Camus, a wine merchant, was also shot down in the village.